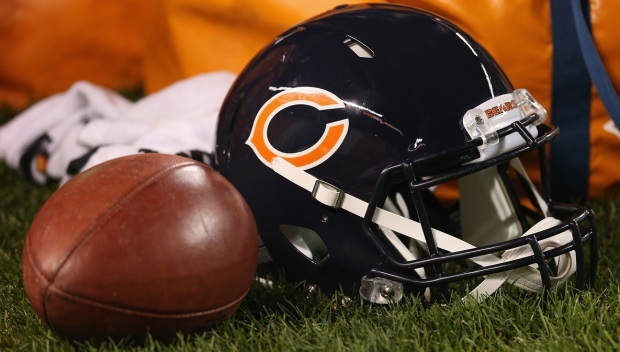 A detailed view of the Chicago Bears April Fool jersey, Tuesday, April 2, 2019, in Lake Forest, Illinois. 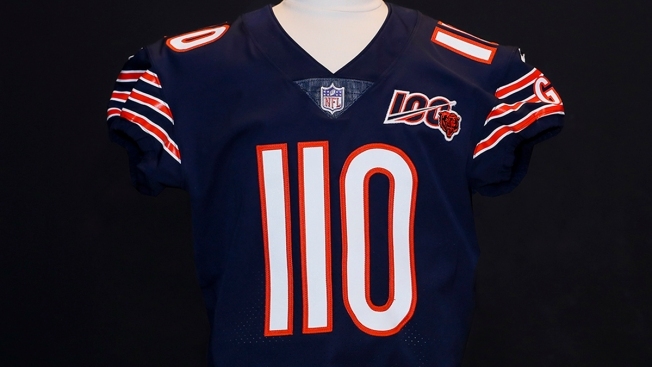 The jerseys, which were designed as a prank to kick-off the team’s 100th anniversary season, won’t actually be worn on the field, but a “110” jersey belonging to quarterback Mitchell Trubisky will be auctioned off on the team’s mobile app, the Bears announced Wednesday. Fans can bid on the jersey, and the proceeds from the auction will benefit Bears Care, the team said in a press release. Trubisky will also sign the jersey and personalize it for the winner. Bidding will remain open on the jersey until 3 p.m. on Wednesday April 10.